1. INTRODUCTION. Historical Background. 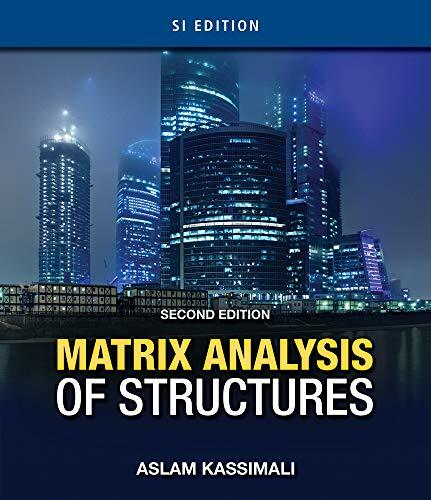 Classical, Matrix, and Finite-Element Methods of Structural Analysis. Flexibility and Stiffness Methods. Classification of Framed Structures. Analytical Models. Fundamental Relationships for Structural Analysis. Linear Versus Nonlinear Analysis. Software. Summary. 2. MATRIX ALGEBRA. Definition of a Matrix. Types of Matrices. Matrix Operations. Gauss-Jordan Elimination Method. Summary. Problems. 3. PLANE TRUSSES. Global and Local Coordinate Systems. Degrees of Freedom. Member Stiffness Relations in the Local Coordinate System. Finite-Element Formulation Using Virtual Work. Coordinate Transformations. Member Stiffness Relations in the Global Coordinate System. Structure Stiffness Relations. Procedure for Analysis. Summary. Problems. 4. COMPUTER PROGRAM FOR ANALYSIS OF PLAIN TRUSSES. Data Input. Assignment of Structure Coordinate Numbers. Generation of the Structure Stiffness Matrix. Formation of the Joint Load Vector. Solution for Joint Displacements. Calculation of Member Forces and Support Reactions. Summary. Problems. 5. BEAMS. Analytical Model. Member Stiffness Relations. Finite-Element Formation Using Virtual Work. Member Fixed-End Forces Due to Loads. Structure Stiffness Relations. Structure Fixed-Joint Forces and Equivalent Joint Loads. Procedure for Analysis. Computer Programs. Summary. Problems. 6. PLANE FRAMES. Analytical Model / Member Stiffness Relations in the Local Coordinate System / Coordinate Transformations / Member Stiffness Relations in the Global Coordinate System / Structure Stiffness Relations / Procedure for Analysis / Computer Program / Summary / Problems 7. MEMBER RELEASES AND SECONDARY EFFECTS. Member Releases in Plane Frames and Beams. Computer Implementation of Analysis for Member Releases. Support Displacements. Computer Implementation of Support Displacement Effects. Temperature Changes and Fabrication Errors. Summary. Problems. 8. THREE-DIMENSIONAL FRAMED STRUCTURES. Space Trusses. Grids. Space Frames. Summary. Problems. 9. SPECIAL TOPICS AND MODELING TECHNIQUES. The Structure Stiffness Matrix Including Restrained Coordinates--An Alternative Formulation of the Stiffness Method. Approximate Matrix Analysis of Rectangular Building Frames. Condan of Degrees of Freedom, and Substructuring. Inclined Roller Supports. Offset Connections. Shear Deformations. Nonprismatic Members. Solution of Large Systems of Stiffness Equations. Summary. Problems. 10. INTRODUCTION TO NONLINEAR STRUCTURAL ANALYSIS. Basic Concept of Geometrically Nonlinear Analysis. Geometrically Nonlinear Analysis of Plane Trusses. Summary. Problems.